After years of trying everything but science fiction, from nerd reality shows, to Wrestling, it looks like the Syfy channel is coming home. We started to see a few science fiction toes dip in the water with last December’s miniseries event, Ascension, The 6 hour show, played over three nights, is the story of a secret nuclear powered generational starship, launched in 1963, on its way to Alpha Centauri. The story is set in the present day as the ship reaches the half way point; there are factions on the ship that want to turn the ship around to head to earth. Meanwhile on Earth the son of the founder of the Ascension program is doing his best to maintain the earth end of the program and keep it a secret. There is a very big spoiler involved in all of this which I found absolutely delicious, and definitely defies your conceptions of what this show really is, however it’s nice to see an adult drama in a science fiction setting. We’ve not really had a space opera like that since Battlestar Galactica. In fact, that’s probably how the show was pitched; Mad Men meets Battlestar Galactica. There is definitely a cultural stuck in amber effect since the crew left earth in the early 1960’s, without the benefit of women’s lib or the civil rights movement. However the ship culture has evolved in interesting ways, and featured some political maneuvering that tops House of Cards in plausible political chess play. Unfortunately this show wasn’t picked up, but even so, I recommend watching the miniseries when it’s available on DVD or for In Demand and streaming. 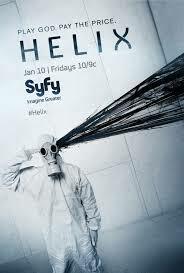 And January was the season two premiere of Helix. This is another show that isn’t exactly what I thought it would be. Before season one, just based on watching the promos and trailers I would have guessed Zombies meet Andromeda Strain. However after watching the entirety of Season one, I can’t come up with a simple description of the premise, so I really don’t know how it was pitched to the networks. Maybe they actually did pitch it as Zombies meet Andromeda Strain and then decided to do their own thing. In any case, it worked, and season two seemed to start off as almost an entirely new show, with the same characters but facing some entirely new challenges. I guess I’m excited about this show because I can’t guess what they’re doing. It’s nice to be surprised with good writing without resorting to the multitude of common TV tropes. 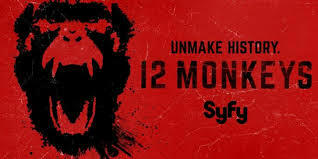 The TV adaptation of 12 Monkeys also premiered in January. This time travel episodic TV series is based on the movie, but diverges quite a bit in order to make episodic TV work. The basic plot is that in the plague decimated year of 2043, a small group of scientists are trying to send someone back in time to stop the virus from killing off 7 billion people in the first place. The show takes it’s time travel seriously and takes its characters seriously. We don’t know much about the villains yet, but the heroes are flawed and have done some terrible things to save the world, and sometimes, their motives reveal much more personal motives than world saving. It’s a great show and apparently enough people agree with me so that it’s already been renewed for another season. Also in 2015 (again, sometime this year) two more space opera type shows are being produced for Syfy, Dark Matter is about a spaceship crew that come out of suspended animation with no memories of who they are and what they are doing there. There is a lot of room for mystery there. Also coming up is Killjoys about, who else, interplanetary bounty hunters. So take that Boba Fett. That’s a lot of real science fiction on air. So its good news, but I also hope it’s good science fiction. This entry was posted in Pop Culture, TV & Movie Reviews and tagged 12 Monkeys, Ascension, Battlestar Galactica, Dark Matter, Helix, House of Cards, James S. A. Corey, Killjoys, science fiction, space opera, Syfy Channel, The Expanse, TV Reviews. Bookmark the permalink. 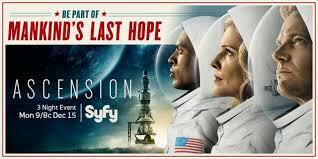 I can’t stand SyFy’s dramas. Corny acting and superficial sci-fi ala the worst of network television. I actually prefer the reality shows, I think. At least I really enjoyed Jim Henson Creature Shop Challenge.